Sew Cute: Sew Cute Holiday: Stocking Stuffers under $50! The holidays are right around the corner... literally! So, we are all scrambling to find last minute gifts and goodies for everyone on our lists. 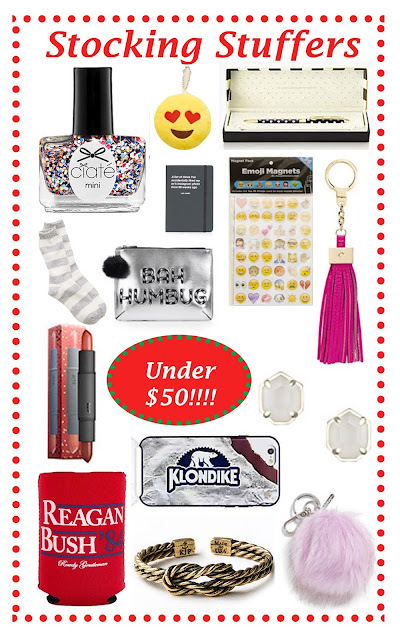 Well, I have compiled a few of my favorite things out there that make the perfect stocking stuffer or last minute gift. The best part? All of these gifts are under $50 if not under $25! Which is perfect because you can't spend the big bucks on everyone on your list! So, get your last minute shopping done so you can enjoy a cup of hot chocolate and a Christmas movie. What are your favorite stocking stuffers? Let me know in the comments! Loving these stocking stuffers! That tassel keychain is so cute and I actually have a similar pouf keychain from nordstrom - the perfect purse charm!